BEVERLY - Edward J. Carbrey, Jr., age 94, beloved husband of Frances L. (Scibisz) Carbrey passed away on October 5, 2018, at Care One Essex Park, Beverly. Born in Peabody he was the son of the late Edward J. and Anna M. (Wilfore) Carbrey, Sr. He was a graduate of Danvers High School, Bowdoin College and Northeastern University. 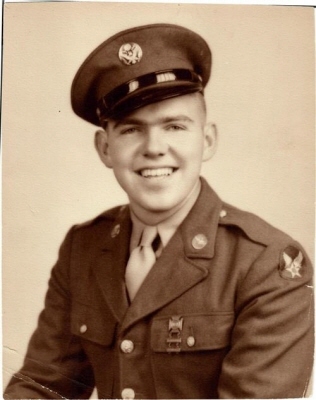 An honorably discharged veteran, he proudly served his country during WWII as a Sergeant in the United States Army and Royal Airforce. Mr. Carbrey worked at General Electric in Lynn for 3 years as a Manufacturing Engineer, then for the rest of his career worked at MIT in Cambridge as an Engineer, Publications Section Chief, and a lecturer on Communicating Technical Information. Ed was a train enthusiast and enjoyed traveling the U.S. by railway. Surviving him in addition to his wife Frances are two sons, Peter J. Carbrey and his wife Angelica of Lansing KS, Mark F. Carbrey and his wife Judy of Essex; a daughter, Sue M. Silva and her husband Thomas of Alachua, FL; a stepson, Dana P. Smerczynski and his wife Caroline of Beverly; two stepdaughters, Shelley A. Beaulieu of Beverly and Karen M. Ward and her husband Bill of Spring Hill, FL; a sister, Ruth Devarenne and her husband John of Danvers; his grandchildren, Paul, Alura, Kristina, Michelle, Eric, Jeffery, Brandon, Joanne, Leah, Alyssa, Shane, Dillon, many great-grandchildren, nieces and nephews. He was predeceased by his first wife, Frances J. (Sullivan) Carbrey, a son Paul E. Carbrey, and his sister Marie Cimon. To send flowers or a remembrance gift to the family of Edward J. Carbrey, please visit our Tribute Store. "Email Address" would like to share the life celebration of Edward J. Carbrey. Click on the "link" to go to share a favorite memory or leave a condolence message for the family.